We have a new tea flavor to tell you about. It's a Zhena's Gypsy rooibos called Acai Berry: Herbal Superfruit Tea. This is the description from the can: "Prized for its healthful benefits, lush Brazilian Acai berry is blended with antioxidant rich South African Rooibos and enriched with the bright lively notes of lemongrass, mandarin orange, and juicy peach. Hibiscus flowers from Egypt produce a naturally sweet and satisfying cup abundant in health promoting properties." [Note: I'm reading what is on the can and not making or supporting any claims.] And almost anyone can drink it as it is caffeine free, fair trade, gluten free, kosher, organic, and vegan. Brewing instructions: bring water to a full boil, pour over sachet, let steep 3 - 5 minutes. For iced tea, use 2 sachets and pour over ice after steeping. We made hot this morning. Let it steep 4 minutes. Added no sugar or milk. It was really good! Now, as it cooled the flavor morphed so I'm not sure I'd like it iced. However, I'm willing to try it using their directions. It could be better when iced right and not just let to get cold over time. One of the flavors sticks out funny...it might be the licorice root. The new way we'll do the trivia is as a statement or "did you know" style question. Did you know that while Molly's father was in England treating wounded soldiers her mother volunteered everyday at the Red Cross? Did you know the American Red Cross was established by Clara Barton on May 21, 1881. The organization is still helping people today. When AG was retiring the Hopscotch Hill line there was another set we brought into our menagerie. The Duckling Incubater. This is Coconut and I watching over the incubator and newly hatched ducklings. There are three eggs in a tub with a lid and light. Then they hatch and you have three cute ducklings. I think bunnies would like green tea best, if they drank tea. Perhaps a root tisane brewed from beet, carrot, and radish tops. Although, I'm certain the March Hare drank a regular black tea blend at the Mad Hatter's tea party. Did the White Rabbit stop to drink anything? Today started out with a hastily brewed cup of tea from a local convenience star. Sadly they were out of Bigelow English Teatime, so we settled for their "Standard Blend." It was okay. We would have preferred the English Teatime, beggars can't be choosers. 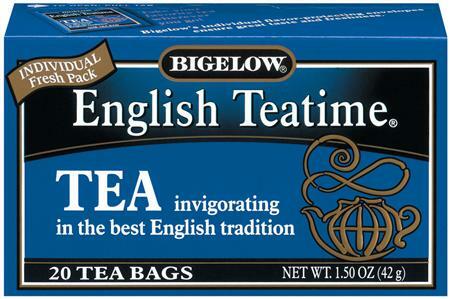 Hmmm, Bigelow has a tea blog called "Constant Comments." Amusing and appropriate if you know their teas. Made Xyra chuckle. One of Xyra's favorite books of all time is Walt Disney's Bunny Book. 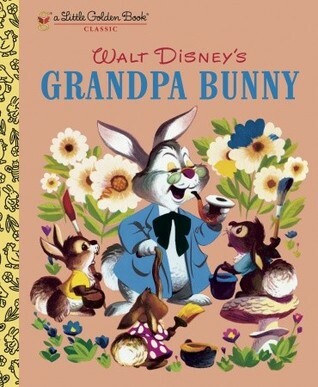 You can now find it as a Little Golden Book entitled Walt Disney's Grandpa Bunny. Our copy is the Big Golden Book version and it was given to Xyra by her maternal grandparents (her mom's parents). Her daddy used to read it to her. (She loves the Hardy Boys because her mom used to read them to her then they read them together.) Anyway, in this story Grandpa Bunny teaches the little bunnies about the colors of the seasons. The illustrations are fabulous! The story is cute, funny in spots, and very touching. It's a quick read. Well, you already know about Coco and the kitties in our house, but we also have house rabbits too! The first rabbit to arrive was Razzi. Razzi was part of the Hopscotch Hill School line of products. The Hopscotch Hill line was retired in 2006. He came with a tree stump hutch, food dish with lettuce, and carrot-shaped water bottle. I love his ears! The last bunny, Lulu, arrived with Lanie in 2010 (Lanie's story is a future post). She is a tan, lop-eared bunny. On of her great talents is being harnessed trained to walk or hop on a lead. Not an easy feat. I'm surprised the harness hasn't been chewed to bits. That's it for our bunnies. Have you spotted any of our other animals in previous posts? I promise to tell you about them in the future. Reminder: When you have pets, you need to be responsible for their health and well being. Be gentle when caring for them. Keep them fed and cleaned and their living area clean too. PS. These are Xyra's bunnies Digger and Flash. We send our thoughts and prayers out to all experiencing wild weather ~ may you and your families be safe. Remember the spring bloom report earlier? Kaya and Kirsten pointed out a few things at the corner of the one garden. There are lots of things to do inside and outside the house depending on the weather. We took advantage of the sunshine and decide to go tree climbing! Kaya got the highest. I slipped on my first try, but wasn't hurt - it was a very short drop. If you decide to try tree climbing, follow these rules. We four American Girls send our thanks and appreciation to all veterans and service men and women from yesterday, today, and tomorrow who have served our country to keep it safe. We salute you! Is your family looking to help those in need in Oklahoma? The following organizations are hard at work in Monroe, OK.
For more information see USAToday. 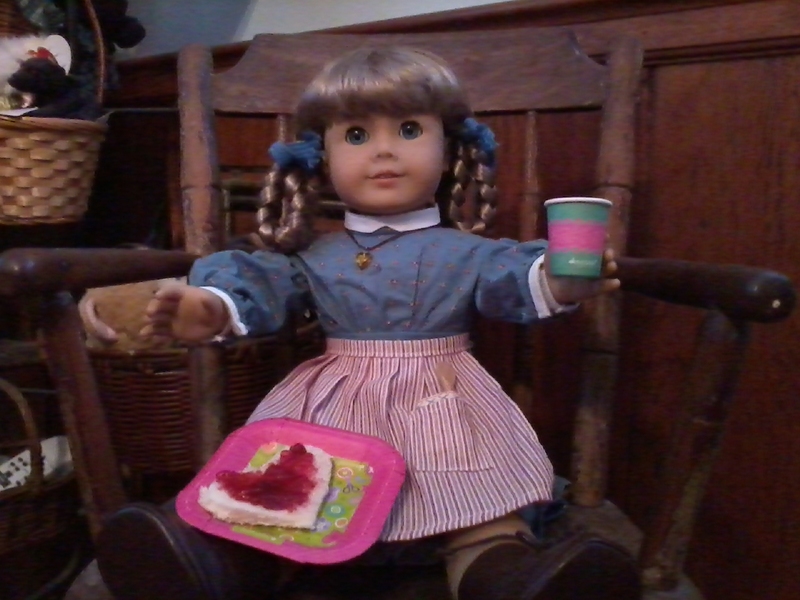 It was really dark this morning so Kirsten insisted we have her favorite bread and lingonberry preserves for breakfast. 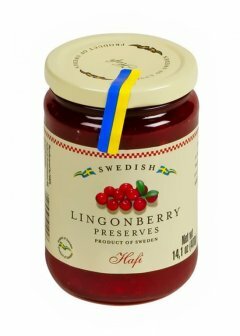 Lingonberries are native to Sweden and are very much like our cranberries, but smaller. We found this jar of preserves at Home Goods. However, IKEA was where Xyra was introduced to lingonberry juice and other products. Breakfast was really tasty. The brown sugar melts on the cereal and creates a bit of a shell on top but syrup along the edges. Here is Kirsten finishing off her bread and jam. 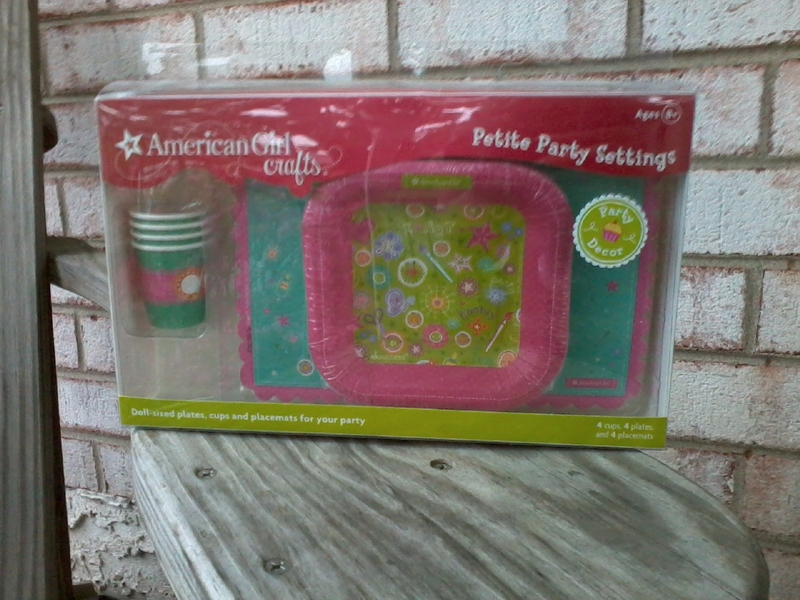 Kirsten’s plate and cup are part of the American Girl Crafts line. The Petite Party Settings set. We found that at Michael’s craft store. The set includes 4 cups, placemats, and plates. 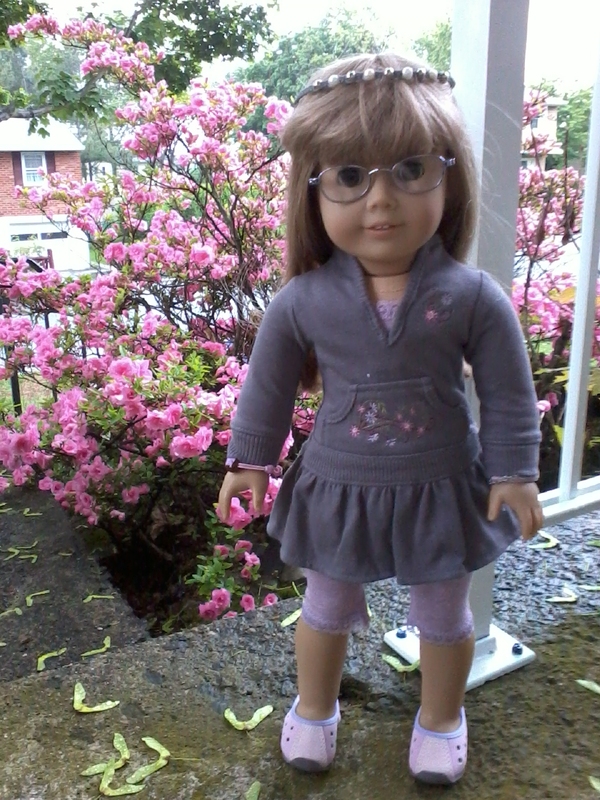 After breakfast I darted outside to look at the azaleas. I had thought our azaleas were done blooming, but the one in front is just starting. Doesn’t it look beautiful? I’m wearing the Licorice Play Outfit today. It is a bit warm for the sleeves, but I can push them up. The Licorice Play Outfit was added to the catalog in 2007. You could buy it up through 2009 – then it was retired. This is an older picture it shows the lunch kit. I love the lunch kit with Licorice’s picture on it. However, in neither photo am I wearing the headband. It’s really pretty and matches the outfit perfectly. Have a great day and night! Get your tea ready and hunker down in your favorite reading spot! 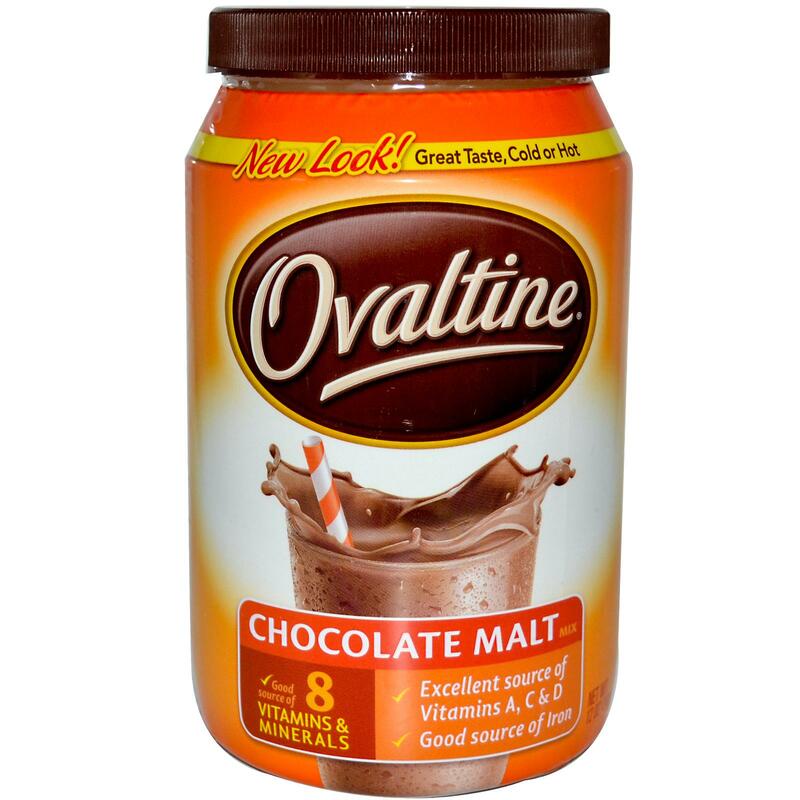 What kind of tea today...well, honestly, I'm drinking chocolate malt Ovaltine - not tea at all; chocolate milk. BUT it is in a tea cup! Quick note on a layout change. I'm not happy with how the polls work, so I'm taking them out and adjusting the game questions to be trivia bits instead. AG Read-A-Palooza started May 1 and runs through August 26. Click Read-A-Palooza for details and more. You'll find links to pieces of stories, trivia, printable activities (my favorite), and much more. In the bottom right corner it explains, "Through August 26, $1 of every book purchased through American Girl goes to Save the Children's US Literacy Program (up to a maximum of $100,000). E-book sales do not qualify for donation." Read-A-Palooza is part of American Girl's Shine One Now effort. Check out Shine On Now and the Ambassador Tool Kit. The kit is a free, printable, pdf file. It give you ideas on how to help out around your neighborhood. 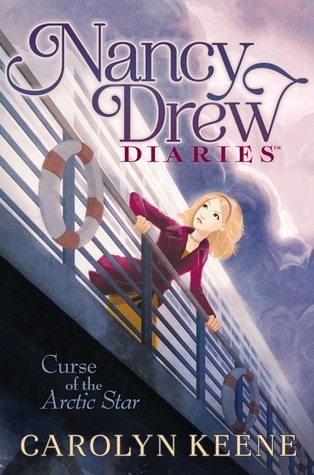 Xyra and I just finished reading Nancy Drew Diaries #1: Curse of the Arctic Star. This is my review. I give it 4 out of 5 stars. I really liked it. Nancy and her friends are asked to help find out who is sabotaging the first voyage of a new cruise line. The cruise takes place over summer break. Nancy, Bess, and George head to Vancouver, British Columbia to start the journey to Alaska. Strange things start happening before they even leave the dock. Some things even seem to be pointed directly at Nancy (Who would go after Nancy? She's cool!) while the ship is huge, the list of suspects is short. The story is easy to read and flows nicely. I don't want to spoil it for you, but there is a cliffhanger that leads the reader to book #2, Strangers on a Train. I'm looking forward to that one. As I said, Xyra read it too.Her review is bit different. Click to read Xyra's Curse of the Arctic Star review. I’ve been so excited about today and this post! The dress is two pieces—an ankle-length skirt and beaded bodice in pale green taffeta. The skirt has knife pleats at the waist and an attached petticoat exposed at the hem. The tank-style bodice has detailed sleeves, a v-point waist, and delicate floral embellishment (we like to watch Project Runway sometimes…I remember some phrases. :-) ). 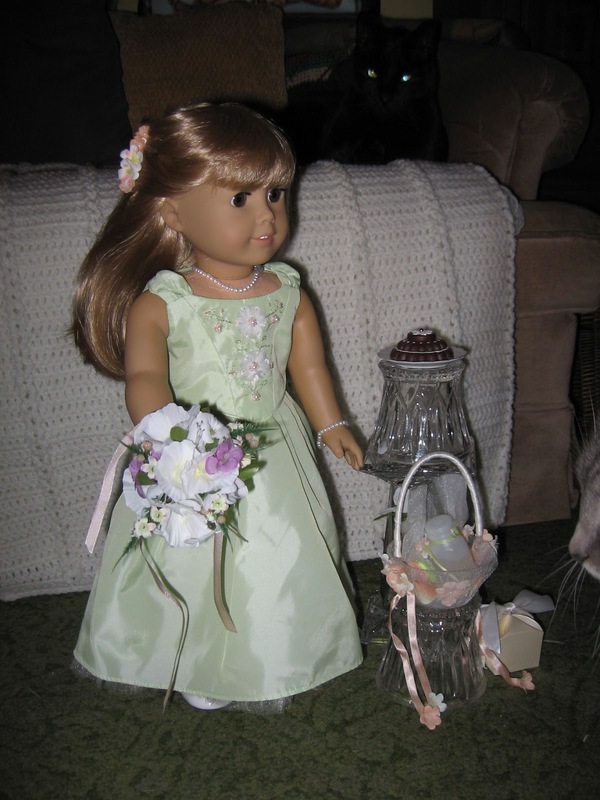 To complete the outfit…a pair of white, patent leather, t-strap shoes; hair comb with peach and white flowers; and pearl necklace. This is one of those outfits where you must get the accessories to complete the look. Xyra did! The Flowers and Favors accessory kit included my bouquet (a nosegay), flower girl basket with rose petal sachets, bubbles, a chocolate cake, porcelain plate, and a gift box with a pearl bracelet that matched my necklace. Now back to wearing it for real and being a part of something so special. I suppose I am a day early since the reception was May 17, 2003. The wedding reception was at a tourist railroad. I got to hangout in the “waiting room” of the station and watch over the gifts. The one corner had a great spot for me and small gifts, then larger gifts were placed on the benches that lined the two adjacent walls. I had a great view. The weather was cool and overcast, but I didn’t mind. Someone had to keep the gifts safe. :-) Plus I wasn’t alone, a beautiful white bunny kept me company. If you are planning a bridal shower, a tea party is a fun way to go. For the best selection of teas, you’ll want to include decaffeinated and herbals. Plus, I suppose there are those that will prefer coffee (blech!). To make it special you can search flea markets, swap meets, and yard sales for tea cups with saucers, tea pots, and sugar & creamer sets. The cups & saucers can be favors for your guests. This idea works for a Bride’s Luncheon as well. Just a quick note to let you know that Michael's has American Girl Crafts on sale at 25% off. We saw the sale on Saturday and picked up a few ideas and a great set of stickers. If you have a store location nearby you and your parent(s) can check it out. Some were a bit expensive, but the stickers were pretty cool. We're looking forward to sharing our ideas with you in the near future. 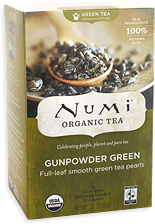 Great item for tea lovers today. Coffee lovers swear that grinding your own beans makes a better cup of coffee (I wouldn’t know…not a coffee fan). Well, there is a similar rule in the world of tea…loose leaf is better than tea bags. An earlier post described how loose tea dances in the water when steeping allowing leaves to open fully and give more flavor than those confined in a bag. We (Xyra, my sisters, and I) like both loose and bagged tea, but today we will focus on loose leaf. There are several ways to prepare loose leaf tea. The most common is to put the tea in an infuser and drop the infuser in your teapot to steep. 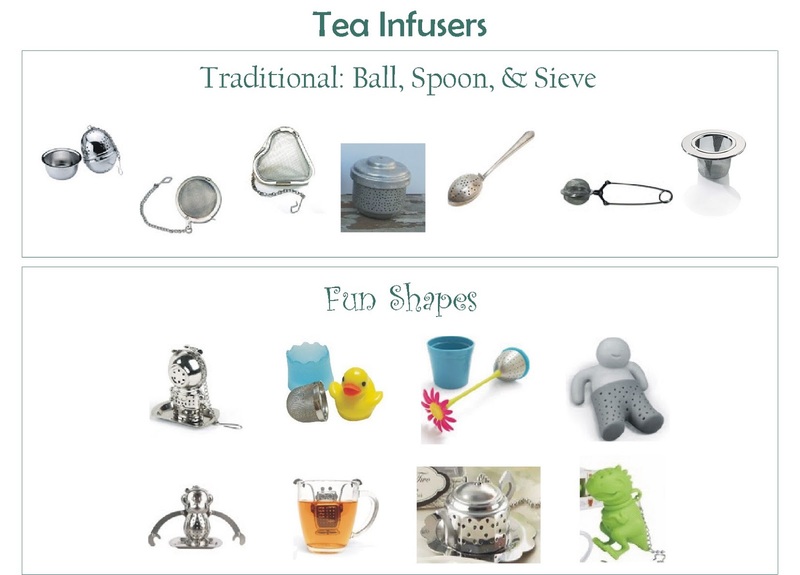 Infusers come in many different styles. Here are a few. The fun shapes from left to right: (top row) diver, ducky, flower, man (lower row) monkey, robot, teapot, T-Rex. Plus you can use the glass, infuser teapots (see earlier posts). Our friend, Lady Marvin of the Lamp Post, introduced us to a really neat infuser teapot you can use when making one cup. It’s IngenuiTEA: the ingenious teapot. Xyra googled it and found Wegman’s grocery store carries it. Yay! We used Assam Breakfast Indian tea today. This is what it looks like before water is added. Oops! I misjudged the size of that mug, but wanted to use a clear mug so you could see better. See how the sugar and milk are automatically mixed when the tea is added. The box says, “works with any cup.” It does not fit on this Longaberger mug because of the lip and diameter of the opening. 3” maximum (well 3¼”). It’s really a great system and fun to use. There is one drawback…emptying the used tea leaves. They tend to stick. So we use a spoon or baking, rubber scraper to get them all out. It’s well worth the small clean up effort to get a great cup of tea. Thank you for the hint, Lady Marvin! Raising our cups to you. It really does have a nice flavor. Not grassy like some greens can be. Don’t over steep though or it will be bitter. I added just a little bit of sugar (less than a teaspoon) and nothing else. 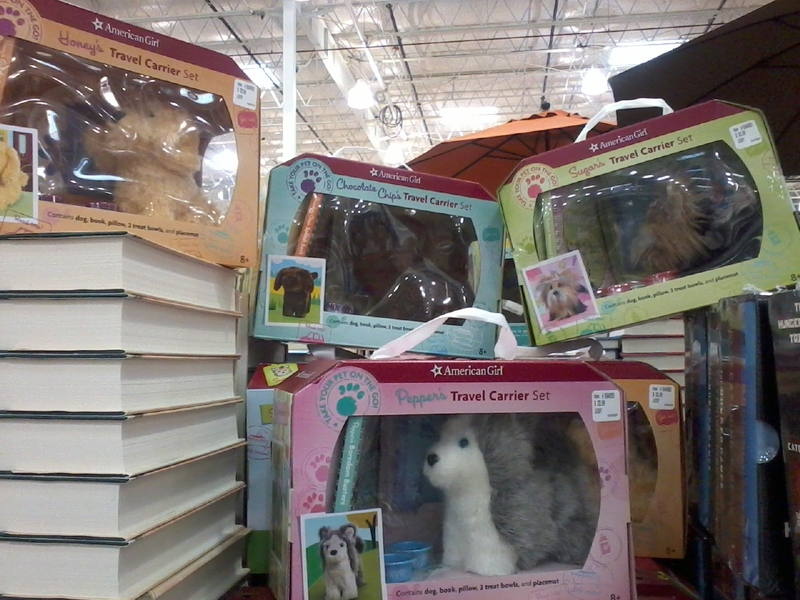 The other month I mentioned seeing an ad for AG Pet Travel Sets at Costco. Last week, Xyra went and found them! There were only 4 sets to choose from and of those four pets there were more Sugar and Chocolate Chip sets. Only one Honey and one Pepper in the whole bunch. And NO Meatloaf at all. L We were really hoping he’d be there. Honey (upper left) is a golden retriever. According to the American Kennel Club, “The golden-colored coat is the hallmark of this versatile breed, and can range from light to dark gold.” The golden retriever is a member of the sporting group. The breed is intelligent, active, and energetic with “an eager to please” attitude. They can adapt to different living situations which make them useful as hunting companions, guides, and assistance and search and rescue dogs. They require daily exercise an regular brushing. Honey is currently available through AG website. 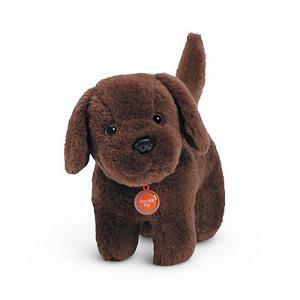 Chocolate Chip (top center) is a chocolate Labrador Retriever. Labs are the most popular breed in the U.S. They are gentle, intelligent, and family friendly. Because they have an even temperament and want to please they make great hunting companions; excel as guides for the blind, members of search and rescue teams, or as police K-9 narcotics detectors. Labs need regular exercise and grooming. 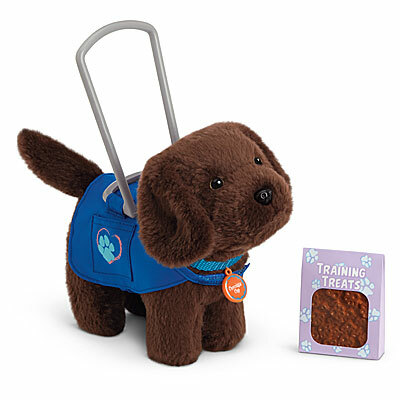 Chocolate Chip was retired as an individual pet in 2012, but can still be found through the AG website in the Service Dog Set. Sugar (upper right) is a Yorkshire terrier. Yorkies offer big personalities in a small package. They are brave, determined, investigative and energetic. 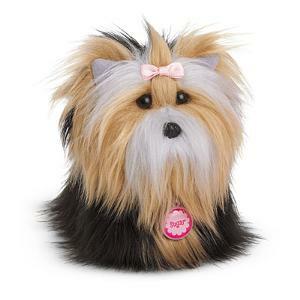 Yorkies are easily adaptable to all surroundings, travel well and make suitable pets for many homes. Due to their small size, they require limited exercise, but need daily interaction with their people. They have long, luxurious blue and tan coats that require regular brushing. Sugar was retired in 2012.
Pepper (bottom center) is a Siberian Husky. 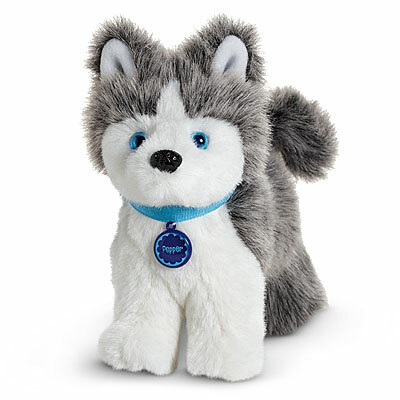 The Siberian Husky is known for its amazing endurance and willingness to work. Its agreeable and outgoing temperament makes it a great all-around dog, suitable for anything from sledding to therapy work. Huskies have a thicker coat than most other breeds of dog - made up of a dense cashmere-like undercoat and a longer, coarse top coat - that requires weekly brushing. They need daily exercise through walks or an enclosed run. Huskies have strong predatory instincts, so should be supervised around small animals in and around the home. 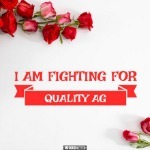 Currently available through AG website and catalog. Lanie, Kaya, and Kirsten kind of had a fit after yesterday’s post. Especially Lanie, she said we missed a lot and wants to show you what she found out in the garden with Kaya & Kirsten. So off we go…back to the garden. Well, they went. I stayed in to find a new outfit to wear. Lanie ran out the door as quick as she could and right to the white ruffled tulips. This is what they look like inside…see the ruffle? Very delicate and pretty. Now the really tall red tulip from yesterday looks like this inside. Completely different, right? We were trying to figure out if we could see a face or an animal in that pattern. What do you think? Next she went to check out the bleeding heart plant. See how the tiny white flowers are heart shaped. You can see three branches filled with the blooms, but there are two more that are not in the picture. Then she sat and watched a bumble bee pollinate the azalea; diligently moving from flower to flower. It took a while to get this picture. Xyra would have the bumble all lined up and ready to click then it was off to another flower and out of the frame. Eventually we got two good shots. You can’t see it, but his legs are covered in yellow pollen. Lanie found three more ruffled tulips. These two are right in a row. She really likes how the one shows just a hint of pink. Kirsten went straight to the green and white hosta. Unfortunately, she pointed out that this is really the spot that needs the most weeding. It’s hard to keep the grass out of this section of garden. In the foreground is creeping vinca. It’s really pretty here, but spreads wildly through underground runners. To the right those long, green leaves indicate where Irises will bloom in the future. Finally, the tiny almost white looking flower is creeping phlox. It’s beautiful. This is a great view. You can see how the vinca is spreading through the garden. Kirsten is standing behind a corabelle plant. It will get pretty pink flowers that last a loooooonnnnnnggggggg time. We hope you enjoyed the second installment of our garden tour.